Made by Bayerische Motoren Werke Ag. in Munich, Germany, 1965. The motorcycle is a model R50. It features swing forks, twin cylinders, a long seat for a pillion passenger, registration plates DU 582, and is registered in the name of Charis E. Schwarz-McKittrick until July 2017. The motorcycle has two Dri-Rider saddle bags and a Dri-Rider tank bag. It is fitted with some non-standard items including a 'kill switch' in the tank bag handmade by George Schwarz and weather protection hand guards. Production of Bayerische Motoren Werke (BMW) motorcycles began in Munich in 1921 with the firm established in 1916 to make aircraft engines but later moved to Spandau. The firm's name for decades has been associated with their flat twin-engine motorcycles known as boxers. From 1928 until 1950 BMW produced supercharged models for several well-known work's riders even breaking the world speed record several times between 1929 and 1937. All BMW motorcycles to 1954 had telescopic forks, tubular frames and plunger rear suspension. In fact, the firm were amongst the first to use telescopic forks. After that date, and the introduction of the R50 and R60 models, swinging arms front and rear were used. The firm were famous in the early days for their horizontally-opposed, twin-cylinder engine models with semi-unitary construction layout and shaft drive. This design was retained together with the later K-series three and four-cylinder motorcycles. Lewis, Valerie, (General Editor), 'Miller's Classic Motorcycles Price Guide, Vol II, 1995, p.19-20. Tragatsch, Erwin, 'The Illustrated Encyclopaedia of Motorcycles', Chartwell Books Inc., New Jersey, USA, 1991, pp 89-91. 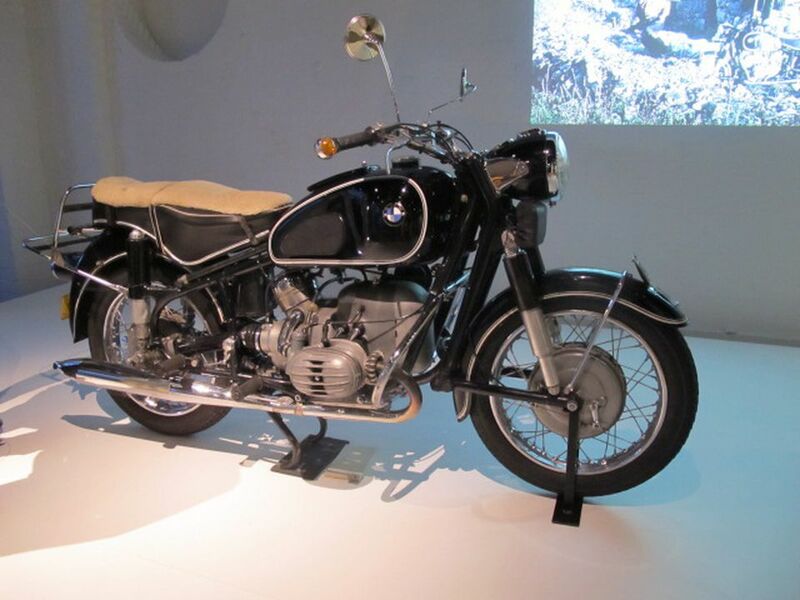 This BMW motorcycle was purchased new from the Bayerishce Motoren Werke showroom in Munich, Germany, on 27 April 1965 for 3154 DM (about 400 Australian pounds at the time). As Charis Schwarz relates in her 2004 book, "Out he rolled sleek and absolutely masculine fitted with the extras ordered during our tour of the factory the day before. We'd chosen protective cylinder guards because we knew we'd come off, chromed steel rims in preference to aluminium for rough riding, cross country handle bars for postural comfort and a 24 litre tank giving 150 kilometres extra distance over the standard. We took a dual saddle because our riding style required closed body contact at all times. A chromed rear luggage rack and foot pegs for the pillion rider completed the ensemble". The motorcycle carried them around the world during the mid to late 1960s on a series of adventures. Leaving Germany, they rode back to Spain to prepare for their long ride overland to Australia. The couple left their home in Spain on 29 October 1965 and travelled through France, Italy, Yugoslavia, Bulgaria, Turkey, Syria, Iraq, Iran, West Pakistan, India, Malaysia, Singapore and Australia. It was "rough and ready" travelling. To save money they avoided toll roads, slept next to the bike or sought shelter in abandoned buildings, police compounds and were occasionally taken into people's homes. Sometimes they cooked and ate fresh roadkill found on the road. After their marriage in Sandringham, Victoria, on 16 April 1966, the couple continued their travels by ship to Egypt, then back on the bike across through North Africa and to their home in Almunecar, Spain, on 29 July 1966. It wasn't long before the call of the road was too much to ignore so they saved up again and, leaving on 21 September 1967, set off to sail across the Atlantic on a second adventure, down through Canada, the USA and South America, arriving in back Spain again on 3 March 1968. This trip saw them experience some hair raising adventures such as in Mexico sleeping fully clothed one night on either side of the bike being woken by bandits. They escaped with a great deal of bluff and bravado with George driving and Charis sitting backwards on the pillion seat training their guns (which were never fired) at the would-be attackers. The motorcycle's last long journey involved being freighted from Spain to Sydney where George and Charis had decided to live permanently. Despite the myriad of countries and dangerous situations the couple were exposed to and possible risks to the motorcycle, which was seen as a valuable Western commodity worth stealing, the bike was stolen from their Potts Point, Sydney, home in 1970. A year later George amazingly spotted the bike in nearby Macleay Street. It had been changed and resold with the hub shields and air filter housing chromed, rocker covers and front engine block polished, the 24-litre tank had been replaced with a standard one, the saddle was replaced with an inferior one, the new mufflers replaced with a worn pair, the custom-made oil sump had been removed together with the luggage attachments while one of the carburettors had been replaced with one from another model. Charis and George were able to identify the ownership through photographs and the bike's serial numbers which had not been altered and neither speedometer nor regulator were working. As Charis put it, "Du had been plundered and exploited. Now that he was in our care again, we could make it up to him. We bought him new mufflers and gave him a service and overhaul so we could buy him the registration plates he's still wearing. The thief was identified and brought to justice. He was ordered to pay the compensation claims ... [but] no money could compensate us for the loss of the large capacity tank which we'd hugged with our knees and the saddle we'd been astride for so many joyful, exciting hours." Du is known throughout the BMW motorcycling fraternity in Australia, especially after Charis and George had been awarded BMW's Friends of the Marque'. Apparently, BMW were keen to acquire the bike for their well-known museum in Munich but the couple wanted Du to remain in Sydney and donated it to the MAAS instead in 2016.